As well as running its ‘£100 one way flights’ offer this week, BA Holidays is also offering extra discounts. Until midnight on Thursday, you can save an extra £100 on selected flight + hotel or flight + car packages in the sale. There is a minimum spend of £2,500 per booking and only selected destinations are included. The list of destinations is changing each day, so if you don’t see your choice today then check back tomorrow. Details are on the same page of ba.com as the ‘£100 one way flights’ offer, ie this page. If you are heading to New York this Spring, IHG Rewards Club has some interesting VIP basketball packages on offer to watch the Brooklyn Nets and the Long Island Nets, both at the Barclays Centre in Brooklyn. Here are the games currently on offer and the points required. These are not auctions – you can instantly redeem for the tickets. You can redeem your IHG Rewards Club points for all of these games at the IHG Auctions website. Until 22nd February Hyatt is offering a 30% bonus when you buy World of Hyatt points. The minimum purchase for the bonus is 5,000 points. This is obviously worth a look if you need to top up your account. It may also be worthwhile if considering a stay in a top tier Park Hyatt such as the ones in Paris or Sydney, where buying the points may be cheaper than paying cash. 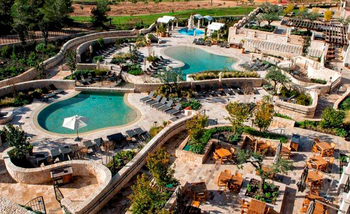 The new-ish Park Hyatt resort in Mallorca – photo above – is another location where buying points makes sense. Prices for cash are a little scary – rooms from €470 in August, or €495 if you want a cancellable one. A redemption at 20,000 points per night ($360) would be a good deal, saving over 30%. Which BA Club Europe routes earn 160 tier points return? What’s the best way to transfer from Amex to IHG? Can’t see them as a hotel redemption partner on my portal? They’re not an amex redemption partner. But at a loss in value of c.60% IMO. We went to the Nets over Christmas – 4 1/4’s of 12 minutes per qtr and the game, which started at 7.30pm, finished at 10.40pm! The jet lagged kicked in around 9pm! Also – just be aware that the Long Island Nets play in the G League which is very much not the NBA. Indeed. A ticket would cost $20 or less, cash and there will always be all the availability you want. I thought a discount of only 5000 points for this match was pretty mean…. Every transaction (in shops not business services) I’ve had with a nationwide credit card behind has been blocked for the last week or so. Other cards are fine. Anyone else seen this? If you ask CUrve they are very forthcoming with the reason for the block. If the reason is Nationwide they give you the exact code to ask Nationwide for the reason. Will be nationwide so just stop using it. Off-topic, so on bits thread. I’m interested in getting a Curve Black card. If I apply now, how long does it take to get the card and be able to use it. I’d like to pay a large tax bill at the end of February using it, if possible. I also read that you have to build up history before you can get the £50000 annual limit. Would I likely be successful in paying HMRC £11k using the Curve card. Any expert advice would be much appreciated. Curve has daily, monthly and annual limits – you will be busting the first two. It also depends which card you are linking. Creation (IHG) has a bender if you try to charge more than £200 or so on Curve – in my experience, yours may vary – so you’d be doing 55 transactions! MBNA in my experience lets you put through larger sums. The new Amex Curve system, launching very soon, will be more efficient as you pre-load Curve from Amex which means the transaction will be approved without issue. What tax is due in late Feb? VAT is 2nd week of Feb, personal tax is 31st Jan, PAYE would be due by 22nd. Thanks for your quick and helpful response Rob. Clearly that won’t work for me then as I wanted to use IHG as the underlying card. I wasn’t aware of the daily and monthly limits. I don’t think I’ll bother them at this stage. Incidentally how long does it take to receive the Curve card after applying. Corporation tax for my limited company due end of Feb 19 for May 18 year end. I would still get the card and build up some transaction history so you are able to use it next time tax payments come around. Can Revolut be used for HMRC payments? It only took a few days for my Curve Black card to arrive back in October/November. Also, I made a couple of payments to HMRC with an underlying IHG card (first payment £500, second around £1,500). Both payments went through fine. Even if you hit the 30-day limit of £5,000, that is half-way to your IHG annual spend requirement (if you’re working towards the £10k free night voucher), so maybe still worth doing? What’s your ‘gut’ feeling on Amex Rob, days, weeks or months? Given there are still plenty of bugs being found I’d suggest weeks, but they may not wait for them all to be squashed! I managed to get multiple £2300 HMRC payments through on a relatively new IHG card just after Christmas. It might depend on the usual value that runs through the card? I don’t know what your issue is with £200 limit on IHG, I have no issue doing 2.5k in one transaction upto the 50k limit. Which retailer(s) are you paying? Creation seem to have tightened up which ones they consider ‘cash-like’ and limit them much more. Surprised you have trouble getting more than £200 through curve linked to an IHG card. Last week had no problem putting my daily limit of £3750 on IHG through curve when buying a car. Although I do wonder if car dealerships have special chip and pin privileges, as Barclays didn’t flinch when I put the other £22k through to complete the payment. Shame they didn’t take Amex! Im waiting for a ‘buy SPG points’ bonus …….Any sign of that happening since the merge ? But SPG did, towards the end, so who knows what Marriott will do? The ‘problem’ is that a big discount means it makes sense to buy points and immediately convert to miles, which probably doesn’t make any money for Marriott given the decent rates! Rob – is 30% the highest discount for Hyatt purchases typically? O/T, Has anyone got any experience of putting PCP (Car fee’s) through a credit card via CURVE? You might need to be more specific for example BMW take AMEX directly. Sorry its 300 a month to Toyota finance. Was hoping this monthly spend could through CURVE. I’ve looked into this for car lease payments and both companies I’ve used insist on the payments being made directly from a bank account by direct debit. It’s very frustrating as if someone did want to stop their payments (and face the consequences!) all they would have to do is cancel the direct debit, so I don’t accept the argument of these companies that this guarantees that the payments will be made. I’m currently negotiating a new lease and am finding that they all seem to require the down payment by bank transfer which again is annoying as I’ll have to use Billhop and pay their fee if I want to earn points from the transaction. I have to BMW finance, for final payment. Paid £3,750 through curve and the rest through current account debit card earlier this month. It is possible to pay on separate days to stay within your daily limit and max out your monthly limit in the final month. I was incorrectly told by an agent that the total balance needs to be paid on the same day, but the agent taking payment confirmed it is fine to pay on stagger your payments within the final month as long as you clear balance 5-7 days before due date to enable them to cancel direct debit request. I have spent over 10k and earned the free night. My card is due for renewal and I want to cancel. Anyone knows when I can cancel and request for an refund without affecting my free nights? As it maybe sometimes before it get posted to my IHG account. I had mine for a full month after the annual fee hit, still got a full refund. No spend in that time. Actually I wish I hadn’t cancelled it now! Can you upgrade the Amex green charge card to plat for the 20k bonus points? Do you get the annual fee ‘bonus’ that occurred with upgrading the gold? Short answer, no. No upgrade route from Green to Plat. I was once green… but then received an upgrade offer to platinum. a few year ago though. You might not need to “convert” him, just create a BAEC account for him and then ask for this to be added to your HHA. I can’t wait till my son is 18 and can earn his upkeep in avios!! O/T but have you seen this, Rob? I have, covering it tomorrow! Rob – pls enquire as to whether VS intend to use this for UC pax, that would be worth missing a LGW/LHR CH. Virgin is building a lounge complex in the new pier. Great, might be able to get in the Escape Lounge in T3 for once if enough people use this new facility! OT – any news with UK version of new Marriott Bonvoy card? Thanks Lee. Interesting. If I’ve read that right they’re suggesting US customers with the basic card will receive an extra free night worth up to 35,000 points when they spend nearly £49,000 on the basic card card. I must have misunderstood. I think you need to change your currency provider! I’m considering asking for a Marriott Platinum challenge, Just need to know will a rewards stay (T/Package 7nights) count towards the 16nights needed? Or just cash bookings.